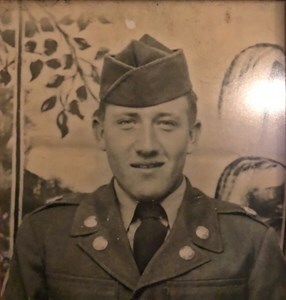 Luverne R. "Steff" Steffens, Sr.
(RET) SFC Luverne R. Steffens, Sr. of Junction City, KS, passed away on Friday, April 5, 2019 at Valley View Senior Life Center. A private family graveside service will take place at Kansas Veterans' Cemetery. Memorial contributions are suggested to be given to the DAV or to the Zion United Church of Christ. Luverne was born February 2, 1932, Red Wing, MN, the son of Rudolph and Edna (Firl) Steffens. Luverne entered the U S Army from April 27, 1950 as a combat engineer until his retirement August 31, 1971. He served in Korea 1950-1951 and in Vietnam 1967-1968, 1970-1971. His awards include the Bronze Star, First Oak Leaf Cluster and the Army Commendation Medal. Following his retirement he worked Civil Service at Fort Riley, KS as a Warehouseman. He was a member of the American Legion, Post #45. He married Lola R. (Lane) on October 15, 1952 in Sidney, NE. She preceded him in death February 4, 2018. He is survived by two sons, Luverne "Vern" Steffens and his wife Doris of Junction City, KS, Michael G. Steffens and his wife Andrea of Junction City, KS; one daughter, Pamela Dishman of Junction City, KS; Seven grandchildren and 11 great-grandchildren. Add your memories to the guest book of Luverne Steffens, Sr.. It was truly an honor to be able to care for Mr. Steff at Valley View. He had a heart of gold and was very kind always. It was always very heartfelt moments to just go into his room while he told me about his old army days or just to get a hug from him. My heart aches for his loving family. May he Rest In Peace for he is no longer in pain. Dear sweet soul may you Rest In Peace with all the beautiful angels I’m so honored to have been able to meet you and give you a great big hug ? ?My deepest condolences to the family and my your memories be lived on. Sorry to hear about the passing of your dad,, just know that I will be thinking about the two of you during this difficult time, I know how hard it is losing parents,, lost my mom a yr ago tomorrow.